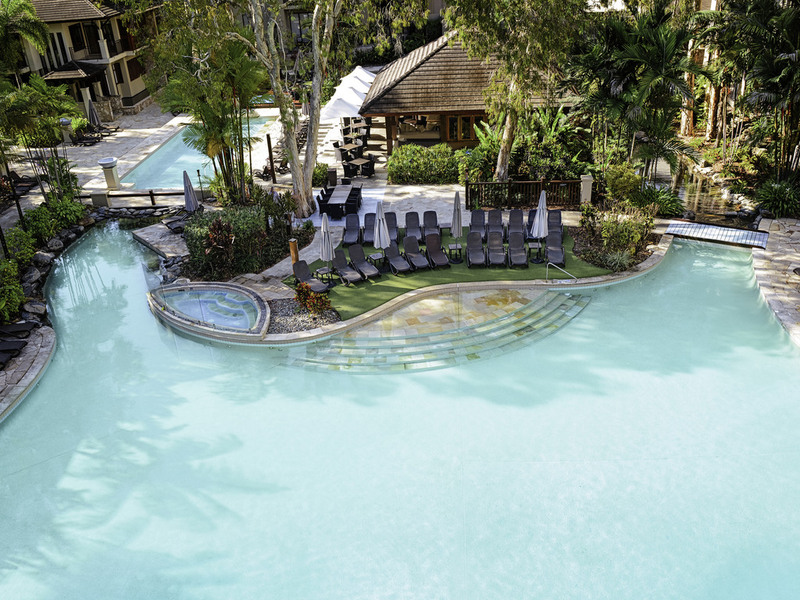 Situated almost half way between Cairns and Port Douglas, Pullman Palm Cove Sea Temple Resort & Spa provides a superb base for exploring the region. As one of the world's seven natural wonders, the Great Barrier Reef is on many people's bucket list - and for good reason. Guests can explore the reef snorkelling or scuba diving, in a boat or on a helicopter. Other areas of interest include the Atherton Tablelands, Millaa Millaa Falls, Barron Gorge, Babinda, the Daintree Rainforest and Mossman Gorge. We were disappointed after our stay last year as I feel the resort needs cleaning and refreshing. My sister and I decided to stay with you again this year as we really enjoyed our stay last year and the fact that the inhouse restaurant used local North Queensland produce on their menu. On arrival, we made our way to our room 328 and noticed what looked like mildew as we swiped our card. We were just going there to chill out as we are locals. I noticed a stuffy smell but didn't want to sound like I was complaining until my sister, (who I had taken there for her birthday) commented on the smell. We turned the aircon off and it went away. I was going to go to the desk but don't like to complain. We ended up not using the aircon at all and kept the door to the balcony open even through the night. I still think you have a great facility but feel it has deteriorated since our stay last year. I did wonder if we were put in downgraded rooms since we were using our Accor card for my free night. We also had gone to the desk and booked in for 6.30pm tea only to turn up and were told we weren't booked in. They were very busy due to the holidays but the wonderful staff in the restaurant found us a table somehow. The food was delicious. Wonderful facilities with excellent staff. At times the resort appeared a little short staffed, however, everyone there was doing their best to maximise the experience. Would certainly not be looking to stay anywhere else when in Palm Cove. Ended up needing to leave a day early and was pleasantly suprised when I was not charged for that night - that does not happen in many places. Will certainly be recommending the resort to others. Loved staying at the Sea Temple at Palm Cove. This was our second visit and we were not disappointed. Great service, quiet place and close to shops and restaurants. From the check-in with Alvin (who was wonderful) to our check-out, your team demonstrated professionalism, humor, kindness, and helpfulness. We were very impressed and appreciative. Our room was beautiful and extremely comfortable. And we enjoyed the property, overall - the pool, proximity to the beach, and proximity to restaurants made it a perfect spot for our vacation. We were greeted with friendly service - flannel and drink was most welcome. Beautiful swimming pools - great being a few steps from the beach. Loved the room and the hotel. Hotel was set up and laid out very well. Very convenient underground car park. Just a couple of minutes walk from the Palm Cove shops, restaurants and beach. Great swimming pools, restaurant, atmosphere was relaxed - fabulous service team. So glad we stayed at Palm Cove instead of Cairns. I came with my husband first time visiting cairns and we loved the look of pullman We booked Pullman palm cove the night of my birthday and to be honest it was such a disappointment. The staff were very blunt no warmth we felt unwelcomed. The buffet breakfast had two rude men working there not helpful and one particular older man was spending condescending to my husband when he asked for service he was so rude and the sad thing was we were so excited to go and have my birthday breakfast. Very upset about our experience. It was our first time going to cairns and we then went to Pullman in port Douglas and we had a completely different experience it was incredible amazing the staff were absolutely wonderful . An extremely relaxing and welcoming stay. Our stay was lovely and relaxing, with wonderful assistance from staff in great facilities. We attended a wedding and stayed the night. Staff at check in were very helpful and friendly. Bar staff need more training on how to redeem discount vouchers, otherwise they were great. Rooms could do with painting and bedside tables were stained or not cleaned. A jug of water in the fridge would have been lovely. Hot water in shower didn't work until after I turned on the hand basin hot water. Concierge was very apologetic when I mentioned it to him on check -out. Food at wedding and breakfast were lovely. Wait/bar staff at wedding were wonderful. The Pullman Palm Cove resort was a most comfortable and delightful place to spend a week. The staff were all excellent, and could not do enough to make sure you had a great time.. the restaurant produces fabulous food andd the pool facilities are great. It’s not far away from the main drag in Palm Cove, but just far enough away to make it quiet and without some of the usual Pal Cove crowds. Our room was well appointed, spacious and very comfortable. It# a great place to stay. My family had a wonderful time staying at your hotel, from the moment we checked in to check out, everything was super easy and painless. Staff were all wonderful and nothing was ever any trouble. I would also like to take this time to express my gratitude to all the staff, as they made my birthday extra special. I love telling everyone that will listen how amazing this hotel is and such a little piece of paradise. My kids didn't want to leave and to be honest neither did the adults! The pool is amazing and my kids loved it! We are locals and visit Sea Temple every month for a luncheon. This was the first time we’ve stayed there, and, hopefully, it won’t be our last. The locals special you offer is very much appreciated. I have being an Accor plus member since 2014; on renewing my membership I found I hadn’t used my free night which is part of the membership so I choose to go to Pullman palm cove for 3 days. When booking the 3 nights there was a package I could choose which included free breakfast, free 2 course dinner, free 2 x 1 hour (30 minutes back massage, 30 minutes facial). I booked the package as well. From the time we arrived and were greeted by Gabby to Simone for our 1 hour indulgence we felt pampered and special. All the staff are courteous, friendly, and nothing is too much trouble. Accor accommodations are great but this place is SPECIAL . Well done to Gabby and her staff. Great resort with very helpful staff and a high level of service. We had a delightful week. The staff were very helpful and level of service was very high. Fabulous pool, spacious clean room, great place to stay. We chose the resort for the pool and swimout room and we were not disappointed. Staff were friendly, parking easy, large room ticked all the boxes. Very good. Too short. Will stay longer next time.